ZZ Top guitarist Billy Gibbons and John Fogerty can be seen jamming on each other’s hits in a new video of a warm-up session ahead of a summer US tour. The pairing then proceed to run through snippets of the endless hits they’ve issued, including CCR's "Fortunate Son," "Bad Moon Rising" and "Up Around the Bend," Fogerty solo hits "Centerfield" and "The Old Man Down the Road," and ZZ Top's "La Grange," "Sharp Dressed Man," "Tush" and "Legs." The month-long “Blues And Bayous" tour will begin in Atlantic City, NJ on May 25, with shows scheduled to wrap up in Welch, MN on June 29. 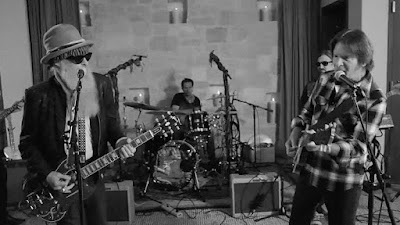 Ahead of the early summer shows, ZZ Top will perform a 6-showresidency at The Venetian Theatre inside The Venetian Las Vegas in April, and Fogerty will host a 6-night residency at The Wynn in Las Vegas in May. CCR were inducted into the Rock And Roll Hall Of Fame in 1993, and ZZ Top were added in 2004.